Here it lately it feels I’ve been living an “Oh la la” Life… a life where everything is seen through rose colored glasses. Of course that could be because I’m sleep deprived from an incredibly busy schedule and my eyes are just a bit blurry – but life has been lived with a gorgeous glow these days! I was delighted when Editor at Large TV chose to cover my Paris Flea Market Fête. If you’re not already familiar with this essential design industry website the best way to describe it is as “the CNN of the design world”. With Editor TV they take their design industry news coverage a bit further by offering a sneak peek into the lives of the people at the heart of the interior design and home furnishings industry. 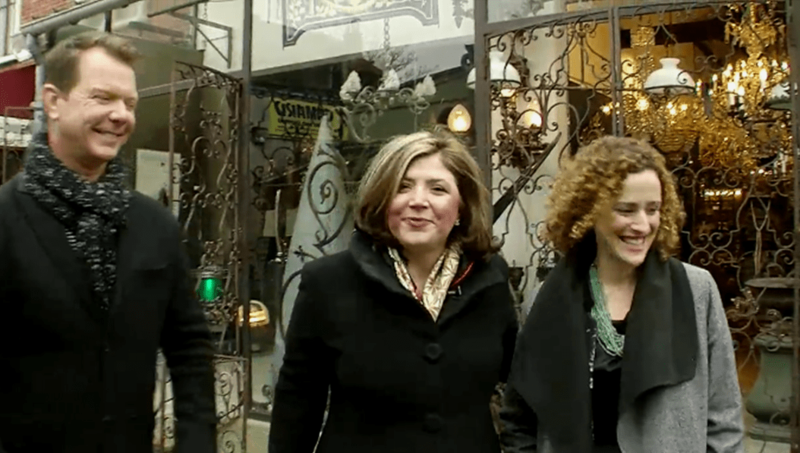 After filming our Paris Flea Market Party, I took Editor at Large TV on a Paris Flea Market Tour with The Antiques Diva: we’re joined by two of my favorite international interior designers – David Dalton and Jennifer Mehditash. Caption: Caught in a candid moment! These jet-set designers do properties around the globe and their client lists read like a who’s who list. They were the perfect people to plunder the Marché aux Puces de Paris with for our Editor at Large TV Tour. But don’t take my word for it – you can watch the tour unfold, diva style. Apologies should email subscribers have a problem watching this video – embeddable video can malfunction for email blog subscribers – if you’re unable to watch the videos here on my own blog – go to Editor at Large TV to watch our Antiques Diva Paris Flea Market tour Part II and Part III. So pop some popcorn and enjoy the show! Loved my virtual tour of the Paris Flea Market with The Antiques Diva – I feel like I was in Paris! I’m so glad you enjoyed your behind the scenes tour of the Paris Flea Market Catherine – looking forward to taking you there again soon! Loved touring the Paris Flea with you and David! Can’t wait for the next time!